Magnetic Wooden Laptop Chalkboard is a wonderful multi function 3 in 1 educational and creative toy. This magnetic chalk board is shaped like a laptop and opens and closes just like the real thing. 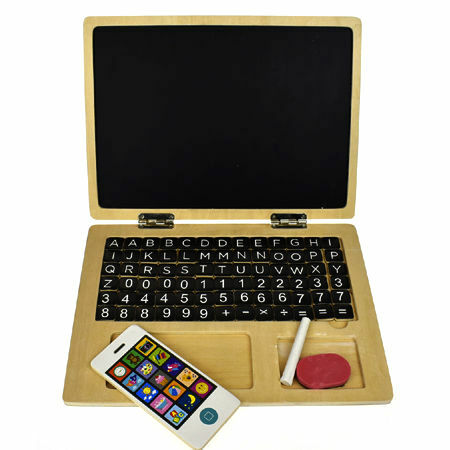 The chalk board is magnetic so the included letters and numbers can be removed from the keyboard area and stuck onto the board to make sums, words or sentences. This is great for copying the letters and numbers shapes with the included chalk. Picture and number sheets serve as inspiration and the little wooden phone takes care of those important calls. Awards: Nominee 2018 Toy award - Nuremberg ( Category- Pre school Age 3-6) Criteria - Play fun. Originality. Safety. Workmanship & quality. Size: 30cm x 22cm x1.4cm (when open 22cm high) Phone 6cm x 0.05cm x 13cm. Material: Wood with child-safe paint. Chalk, cloth duster. We like this because: "So well thought out a great combination of educational and fun."